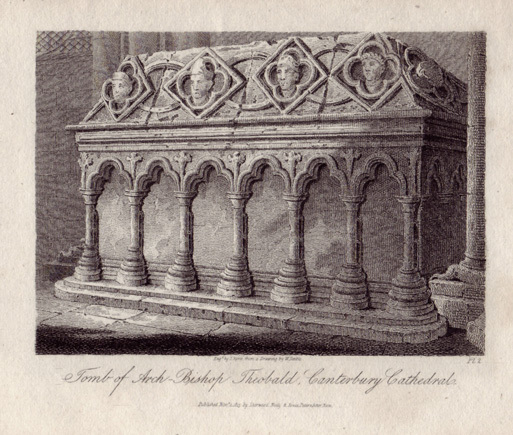 An Ancient Tomb, said to be that of archbishop Theobald it is ornamented with heads, dressed according to the ecclesiastical gradations, from simple monk to papal legate. The widespread interest excited by the problem of the rightful ownership of the tomb that was examined in Canterbury Cathedral on March 8 and l0, 1890, justifies an attempt to put on record the conclusions that have been reached respecting that tomb, and an opportunity is thus afforded of a few words respecting some of the other tombs of Archbishops which present matter for discussion. The tomb lately opened has held quite an exceptional position amongst the tombs in the Cathedral. It is unlike the others in appearance, and looks more like a shrine than an ordinary tomb. A conjecture often repeated suggested that as, at the destruction by fire of this part of the Cathedral in 1174, the monks, according to Gervase, cast down from various beams the shrines of the saints, this tomb might possibly have been made to receive the fragments of the shrines, together with what remained of their contents. This rumour has now been set at rest for ever, as the monument was found on examination to cover a stone coffin, and to contain nothing else. Sindonis officium Candida bissus habet. The winding-sheet in which His limbs reposed. A light pastoral staff of cedar wood with a knop containing three engraved gems (the fourth has been lost), and a very simple volute or head, rested on the body from the right foot to the left shoulder, one hand being beneath it and the other resting on it. It is probable that the maniple and the gloves were of linen, as no trace of them remains. Unfortunately, out of fifty Archbishops and distinguished personages before the Reformation, the locality of whose tombs or shrines have been recorded, only about eighteen monuments are left, many of which are in a greater or less state of dilapidation. With one exception, however, they are all securely appropriated to their respective owners, and thus dated, which greatly increases their value and use for the history of art. Their positions are so minutely described by Archbishop Parker at a period when all the inscriptions remained, that there be no mistake in this respect. Here we may say that a manuscript list of Archbishops, the original of which was taken from Canterbury by Archbishop Parker, and deposited by him in the Corpus Library at Cambridge, of which manuscript a copy in Henry Wharton's handwriting is accessible at Lambeth Palace, will no doubt for the future supersede Parker's own descriptions, for it is more ancient and trustworthy. In the case of Hubert Walter himself. Professor Willis, following Parker in his mistake, assigns for the place of Hubert Walter's tomb "the south wall of the choir aisle. "The manuscript list that corrects this error for us tells us that Hubert Walter lies " near the shrine of St. Thomas," which is the position of the tomb under examination. That list was written by a monk of Canterbury between 1532 and 1538, and on the margin (not copied by Wharton) of the original entry respecting Hubert Walter, Josselin, Archbishop Parker's secretary, has written, "othenvise, under the window on the south side." This window is in the choir aisle, and this note of Josselin's shows us that Parker meant the position under the window in the choir aisle, and thus adopted, if he did not originate, the mistake that Hubert Walter was buried there. We now know that this tomb has not been removed from its original site, for its contents have rested undisturbed since first they were placed there in 1205. It was not erected to receive the bones of some of the Archbishops who were removed, and it is wonderful that Professor Willis, who assigns to them all their places in the church, should have thought it possible. And it is no longer true that no record of a monument in this spot is preserved, for the Corpus MS. indicates it unmistakably as Hubert Walter's. One important result therefore of the recent investigation is the correction of this passage in the invaluable book of Professor Willis on Canterbury Cathedral. The Professor states with great positiveness, and at the same time, no doubt, with perfect truth, that this tomb is not Archbishop Theobald's. Yet, if it were not for positive evidence assigning it to Archbishop Walter, it might have been possible to have made out something of a case for Theobald, once Abbot of Bee, the Archbishop who crowned Henry the Second, and who, dying in 1161, was succeeded by St. Thomas of Canterbury. The story of his removal from his original resting place, nineteen years after his burial, is sufficiently interesting to be told in full. Gervase says that in the old Trinity Chapel Lanfranc lay on the south side, Theobald on the north. And when that Trinity Chapel, the work of St. Anselm and his Priors Ernulf and Conrad, had been destroyed by fire in 1174, the bodies of Lanfranc and Theobald who were buried in it, and of St. Odo and St. Wilfrid who were enshrined in it, rested there amongst the ruins for six years. Gervase himself was an eye-witness of what was done with them in 1180, and his account of the opening of the tomb of Theobald is startlingly like what was seen the other day. I go back a little, to make my extract from Gervase complete, and I avail myself of Professor Willis's translation, retaining, however, the right to alter a word when necessary. The Chapel of the Holy Trinity above mentioned was then levelled to the ground ; this had hitherto remained untouched out of reverence to St. Thomas, who was buried in the crypt. But the saints who reposed in the upper part of the chapel were translated elsewhere, and lest the memory of what was then done should be lost, I will record some of what thereof. On the 8th of the Ides of July the altar of the Holy Trinity was broken up, and from its materials the altar of St. John the Apostle was made; I mention this lest the history of the holy stone should be lost upon which St. Thomas celebrated his first Mass and many times offered the Holy Sacrifice. The stone structure which was behind this altar was taken to pieces. Here, as before said, St. Odo and St. Wilfrid reposed for a long period. These saints were raised in their leaden coffins and carried into the choir. St. Odo in his coffin was placed under the shrine of St. Dunstan, and St. Wilfrid under the shrine of St. Elphege. *The Tombs of the Archbishops in Canterbury Cathedral - J.Morris S.J. F.S.A. Was Archbishop of Canterbury from 1138, he passed away April 18, 1161.